When my Mom was little, she told me her Mother used to make her radish sandwiches. Today I picked up our fresh produce from Birdsong Farms and there just happened to be a bunch of beautiful, peppery radishes. So, I made both of us a radish sandwich for lunch. She said it really brought back happy memories. Thanks for sharing Mom! Recipe : Thinly sliced radishes on bread with mayo, salt & pepper. Simple, light & fresh. Grandma Clark was right! This entry was posted in Lunch on September 3, 2011 by andrewsbeth. Ooooh, I love that! 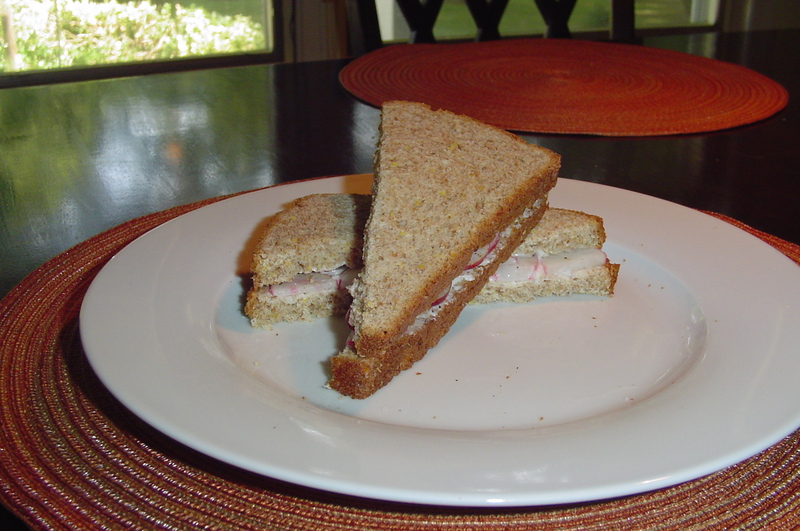 If you cut them in little squares and take off the crusts, then you have a lady’s tea sandwich. On white bread of course. But I love your modern version, and I especially love that you made that for Mom. You are the best in the land, Bethy! The little things mean a lot to Mom. I was happy to see her smiling face when she was eating it.